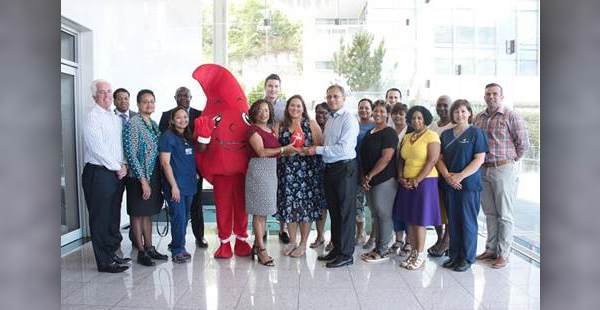 Bermuda Hospitals Board and the Ministry of Health today [June 14] revealed Bacardi Limited as the winner of Bermuda’s Corporate Blood Drive Competition 2018, as part of the celebration of World Blood Donor Day. This is the second time in successive years Bacardi has won the competition. In second place was Butterfield & Vallis and in third, Hamilton Re Group. Kim Wilson, Minister of Health, comments: “Congratulations to Bacardi and thank you to all the competing companies! The Ministry is proud to partner with the Bermuda Blood Donor Centre and BHB for this competition. The eighteen competing companies were: Argo, Argus, Bacardi Ltd, Bank of NT Butterfield, Bermuda Police Service, BF&M, Bermuda Monetary Authority, Butterfield & Vallis, Department of Corrections, Department of Customs, Department of Health, Fidelity, Hamilton Re Group, Hamilton Princess & Beach Club, Kitson Group of Companies, Lancashire Insurance Company Ltd, SunLife Financial International, and Zurich Bermuda. Dr Eyitayo Fakunle, BHB’s Consultant Haematologist, comments: “It’s two years in a row for Bacardi and the competition was on fire this year! What great competitors we had. While someone has to win, every donation counts and all our competing companies have saved lives. Lisa Frias, Manager, Global Finance, Bacardi Limited, adds: “We are excited to have won for a second consecutive year, our second year of participating in the Corporate Blood Drive. Our staff, their families and friends, and even a few of our consultants, responded well, showing the caring that our company is known for.